The theme of the Fourth Sunday of Easter is that of Christ, the Good Shepherd, who gives His life for His sheep, who is Himself the Door to the sheepfold. Although most people today have no experience of sheep or shepherds the image continues to resonate in their hearts no less now than in the first century of Christianity. The image of Christ as the Good Shepherd is one of the oldest in iconography and can be found in the catacombs of St. Priscilla in Rome. 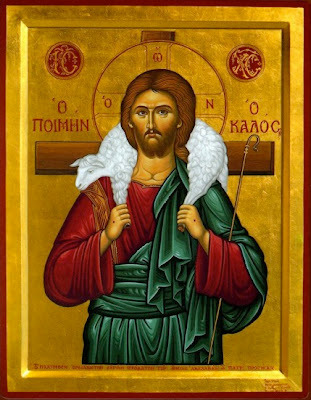 For those of us who have cared for sheep (and believe it or not, right now there are THREE in the community who have: Sr. Mary Catharine, Sr. Mary Veronica and Sr. Maureen) the image of Christ as the Good Shepherd has even more depth of meaning although perhaps not so poetic! Ewe lambs are cute but they are rather stupid and don't get any smarter when they grow up! One need only to get caught in brambles and skirts ripped on fences more than once to pull the same ewe out of a the spot she is stuck in to realize the appropriateness of the image of Christ as Shepherd! We might get exasperated by the stupid antics of a sheep but thankfully, our Lord does not! It's appropriate that Good Shepherd Sunday is also the World Day of Prayer for Vocations! The Good Shepherd delights in calling and inviting us to share with Him in His work of redemption begun on the Cross. It is an invitation of love and is one He invites all of us to be a part of. Perhaps not all are called to be consecrated to Him in the beautiful vocation of the priesthood or religious life but ALL of us can PRAY for vocations and ENCOURAGE young men and women to respond with a whole-hearted YES! to His invitation! So often a young person begins to think about a religious vocation or the priesthood because of a simple remark, "Hey, you'd make a good priest or nun. Ever think about it?" Most of all Our Lord has asked us: "Pray the Lord of the Harvest to send labors into His harvest!" Please read our Holy Father's message for the World Day of Prayer for Vocations. It can be found HERE.